It is rare for an artist to work with colored pencils. To ordinary people, they are an association to the children happily drawing on their coloring books. 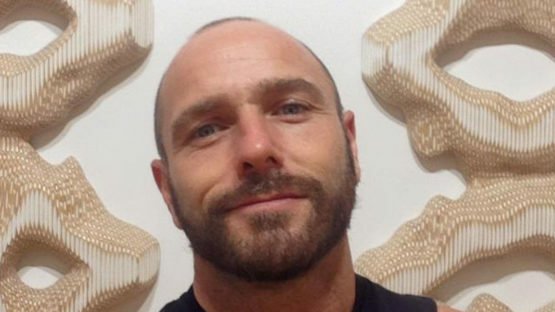 However, that is not the case for the Lionel Bawden, a young Australian artist who decided to work primarily with pencils. Said like this, you might expect to see some drawings, but the main field of the artist’s work is actually the sculpture. The material provides an excellent base for Bawden’s endless inspiration, so some incredible sculptures have been made. At first glance, without engaging deeply, his work seems different, like ‘normal’ sculptures made possibly out of clay, but when observed closely, a new world opens, and it’s made out of something unexpected. Pencils were chosen because of their qualities of color and geometry, and the artist only works with hexagonal ones within a honeycomb pattern. What truly fascinates is the fact that the artist is creating using material which has other purposes, like writing or drawing. The number of pencils required for each piece goes in the thousands, and that is another amazing fact, which emphasizes Lionel’s patience and ability to modify all of them. The form is constructed as he goes, with cutting the pencils into suitable dimensions, and then gluing them into complex forms. He uses a small rotary sander to carve the material, which is then finished with fine sandpaper by hand. The sketches are made, but they are very basic. The artist imagines the sculpture and then works through the process of trials and errors. David Altmejd and Louise Bourgeois are other sculptures who influenced the artist. Even when it comes to exhibiting his work, Bawden remains original. He named his solo show “New works on paper”, giving the viewers the impression they will be watching a collection of drawings, maybe some paintings on paper. Instead, they were greeted by the thousands of pencils combined into magnificent sculptures. The pun was completed with the artist placing his sculptures onto the stacks of Nordset paper which were masqueraded as pedestals. In another exhibition, he changed his usual approach and denied color from his sculptures, making them unusually and very uncharacteristically white. In fact, the accent was on the energy of the form itself. Lionel was born in Sydney and has earned a Bachelor of Visual Arts with Honors in the painting department at The Australian National University, Canberra School of Art in 1997. In 1995, the artist spent half a year in China, honing his skills at The China National Academy of Fine Art in Hangzhou. He became interested in sculpture only after the graduation, so he’s basically a self-taught sculptor. That didn’t stop him from winning the 2009 Wynne Prize or the 2004 ABN Amro emerging Artist Award in Sydney. He was also a recipient of several residencies, including the Art Omi International Artist Residency in New York in 2009 and Creative New Zealand residency at Dunedin Public Art Gallery, New Zealand in 2003. Expect the unexpected could be the motto of Bawden’s work. The viewers are invited to explore and admire the structure, form and precise choice of colors. His medium is making the artworks unique and unlike anything else. They simply require a closer look so the observers could realize what they are made of, and when that happens, a beautiful new world of shapes and colors is opened. Lionel Bawden is based in New South Wales, Australia. All images copyright © Lionel Bawden.